This page last revised September 26, 2015. 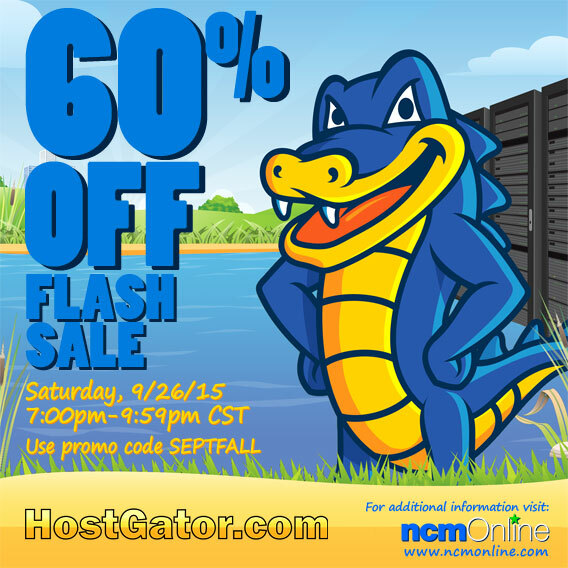 This is HostGator’s Final September Flash Sale! Shop today during sale hours and receive a 60% discount on new WordPress cloud hosting orders, new web hosting orders, and one-year of .com or .net new domain name registrations. But you must place your order during today’s time-limited flash sale in order to save BIG on domain names and web hosting as this 3-hour sale will not be extended. Use coupon code SEPTFALL during checkout. Flash Sale Hours: Saturday, September 26th 7:00 PM thru 9:59 PM CST only. Pro: Designed for small business owners and webmasters who require a secure, resource-rich, and economical high-speed WordPress-optimized hosting solution with fully-featured e-commerce capabilities for up to 20 web sites. This top-of-the-line cloud hosting plan is currently available at only $48.72 per month before flash sale discount. Business: Designed for webmasters with a growing online presence that require a flexible, secure, and moderately priced high-speed WordPress-optimized hosting solution for up to 5 web sites. Currently available at only $18.17 per month before flash sale discount. Starter: Designed for webmasters looking for a fast, secure, and low-cost single-site WordPress-optimized hosting plan. This entry-level cloud hosting plan is currently available at only $6.47 per month before flash sale discount. Business: Designed for small business owners who require a secure, feature-rich, and economical hosting solution with e-commerce capabilities for an unlimited number of domains. Includes a private SSL certificate and one dedicated IP address. This top-of-the-line shared hosting plan is currently available at only $9.72 per month before flash sale discount. Baby: Designed for webmasters looking grow their online presence with a flexible, user-friendly, e-commerce-capable, and moderately priced hosting plan for an unlimited number of domains. Includes shared SSL certificate. Currently available at only $6.47 per month before flash sale discount. Hatchling: Designed for newbies looking for a basic, low-cost, and easy-to-use e-commerce-capable hosting plan for a single domain. Includes shared SSL certificate. This entry-level shared hosting plan is currently available at only $4.52 per month before flash sale discount.